Clearly, the US isn't getting what the rest of the world is going crazy for. That's usually the case, but I feel like in the case of the third-generation Mercedes-Benz A-Class, it's criminally unfair. It's a good-looking small Mercedes, which certainly hasn't happened since skinny ties were cool the first time. Maybe that's why it's setting order records for the company, to the tune of 90,000 takers so far this year. That's potentially going to chance when this, the CLA, debuts in Detroit in January, which we showed you a couple months ago and also been captured by Autocar recently. Because Mercedes and BMW and Audi and Volvo think Americans would rather have a three-box sedan instead of a more practical, still-pretty hatch, the CLA looks like the only iteration of the A-Class we're going to get Stateside. 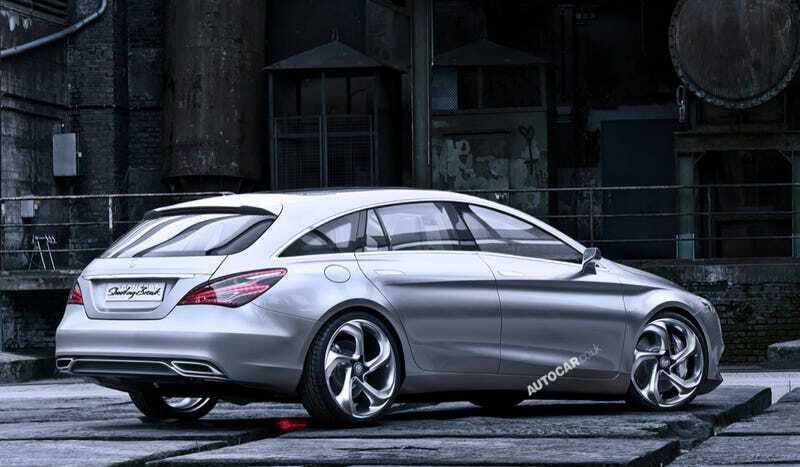 But what's even better is that there's a rumored CLA wagon. Details about the CLA Shooting Brake are scace, but it'll probably be shown sometime next year. I'll wait to see it in the flesh to decide whether it's a true shooting brake, but I love the thought of it so much I don't really care what they call it. And Autocar's report speculates again the AMG model will have 300-something horsepower and the 4Matic all-wheel drive system. Fun. Any small Mercedes wagon that makes it Stateside is golden in my book. Maybe if we start lobbying Mercedes now, it'll make it here 2 or 3 years after it goes on sale in Europe. Fingers crossed. Would you buy a CLA shooting brake?